Peat smoke, pleasantly mixed with floral notes and vanilla. Sherry arrives with dark fruits - cherries, dates and raisins. Pleasantly sweet with toffee and subtle malted barley, with a hint of antiseptic notes in the back. Bold and intense on the palate with a lovely balance of smoke and sweet sherry flavours. Dark fruits with raisins and cherries, immediately followed by a warming spiciness of pepper, nutmeg and allspice. The finish is medium-long and warm with subtle peat smoke, creamy honey and vanilla. Dry oak and lingering nutty flavours on the tail. There's almost no change on the nose when a few drops of water are added. Maybe the flowery notes become more intense while the sweetness is tamed a bit. Significantly more smoke on the palate with slightly enhanced oak spices while the lingering sweetness remains. The finish shows medium length with a pleasant mix of sweet honey, warm oak spice and smoke. A beautifully composed islander. 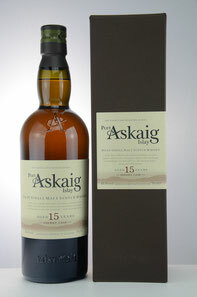 Lovely balance of sherry derived fruitiness, with a delicate sweetness and peaty smokiness. A fruity, peppery and lively expression as a digestif. I thank Kirsch Whisky - The House of Whiskies for the sample and the photograph!